A rubber band powered airplane is a very affordable way to get involved with the hobby. Let’s face it, while flying RC airplanes is completely awesome it can get expensive in a hurry. Don’t let a tight budget deter you from getting involved with the awesome world of model aviation. Too many folks miss out by making the assumption that rubber powered planes are only for kids. Make no mistake, rubber powered planes are challenging and rewarding for adults as well. What you're about to find out is that there's a lot more to rubber powered flight than those cheapo toys you find at the dollar store! 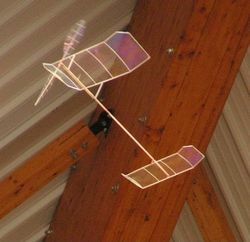 The World Championships class F1D of the FAI(Fédération Aéronautique Internationale) consists of indoor rubber powered free flight models. Some of these models can stay aloft for over 40 minutes while flying indoors! Just like any other hobby, it takes a lot of practice and experience to build a model that can fly this long indoors. You will be off to a good start by reading the Book by Don Ross mentioned above which is an excellent starting point for building your first endurance rubber powered plane. There really aren't that many kits on the market for this type of rubber band powered airplane. That's because playing around with different designs is what makes it fun. However, there's a Canadian modeler by the name of Darcy Whyte who sells a kit called the Squirrel. I have ordered several from him, they're a lot of fun to put together. It comes with all the material and instructions, all you need to buy is some white glue. I have a lot of respect for Darcy as he loves to use his "Squirrel" to teach little kids about aviation. Kits are available containing everything you need including a detailed set of instructions for building tiny version of your favorite full-scale airplane. While it takes a fair amount of work, it is absolutely amazing to watch your rubber powered airplane rise to the sky as the elastic uncoils! Pistachio Scale: Wingspan of 8 inches or less. Peanut Scale: Wingspan between 8 and 13 inches. Walnut Scale: Wingspan between 13 and 18 inches. This goes to show that you don't have to spend a ton of money to build a truly spectacular rubber band powered scale airplane! Both Peck Polymers and Dumas manufacture high quality laser cut kits to build rubber powered scale versions of full scale airplanes. These kits include everything you need to bring your creation to life. The cost of these kits are very little and watching your tiny creation rumble to life as the rubber band unwinds brings a true sense of accomplishment. Not to mention they look nice on the shelf, good to show off when you have company. That's if your wife will allow you to display them! The basic concept of all rubber powered model planes is the same. A rubber band is stretched from the shaft of the propeller to a fixed point on the rear of the aircraft. The rubber band builds potential energy when the propeller is wound in the opposite direction. This potential energy drives the propeller through the flight. The book Rubber Powered Airplanes by Don Ross is an ideal place for a beginner to start. It steps you through the process of building very simple powered stick models to advanced scale models. Includes detailed discussions of rubber motors, propellers, trimming, different designs, you name it. This may be the best book out there for someone looking for a comprehensive break-down of rubber powered free flight. Even a seasoned builder could stand to learn a thing or two from reading through his book.